We left Becky’s and came over to AMS at Hampton, GA. We both like car races and AMS is little over 1 ½ miles which is about one mile longer than the Bristol track. The speeds are 60 MPH faster per lap on the larger AMS. The Bristol track is like racing in a barrel since it is only ½ mile long and is very steeply banked. The AMS track appears to be banked just as steep as BMS but of course is much longer. BMS has a small town feel whereas AMS does not have that feeling. The average lap speed for Sprint cars is around 190 MPH +/- a little. Carl Edwards ran a lap of 192.855 in practice but even Carl could not exceed 190 MPH by much in the qualifying time trials. The temp was up and that affected lap times somewhat. Bristol’s lap time for the same cars was around 130 MPH +/- a little. I got a pit pass from Mark and Wendy. They do volunteer work at AMS. Mark has volunteered for 12 years! That allowed me to “roam” the pits a little with some restrictions. Thanks folks! I enjoyed getting in the pits and plan to go back into the pits again on Sunday afternoon. I got up today (Monday) still thinking about the Sprint Car Race at AMS last night. The race kicked off just past 7:30 Pm which was the official start time. Both BMS and AMS seem to prefer to start their main event races just a little late. This seems to work well since race fans always have to brave very heavy traffic so starting late gives the fans more time to find their seats. Becky’s place is always fun and so very lively. We arrived at Becky’s place on Tuesday and she promptly fed us lunch. Becky leads a very active life with her friends, church work and even has done missions in eastern Europe. She has plans to go to the Dominican Republic on a mission trip very soon! What a busy and fine lady she is. Today we are going down to take a tour of the CNN operations. We are looking forward to that. It should be interesting and fun too. Tomorrow we will go on over to the Atlanta Motor Speedway to RV and/or Boondock at the speedway campground while we attend the NASCAR races at AMS. The last races are Sunday evening. After that, if all goes as planned, we will proceed home on Monday morning and end our current “Rambling in 2014”. Bristol, “ The Last Great Colosseum”. (That’s the way they spell it. )The NASCAR and the Bristol Motor Speedway folks promote BMS in a big and a very positive way. They say “Its Bristol Baby” more than you can believe they do. We’ve never been to Bristol Motor Speedway. They publicize the track as the “Fastest Half-Mile in the World” and after watching four races in the last four days, I have to agree. We saw the modified stock cars race Wednesday, truck races on Thursday, the Nationwide Race Friday, and the Sprint Car race Saturday night. All races were competitive and very fast. The track is like racing in a barrel since the banking is so steep. I bet the corners are banked well over 30 degrees. I do believe even the short straight-a-ways are banked a little too. The track, for most part, is very well managed and extremely fast. The bus shuttle system is really good and saves race fans much walking. The drivers are really skillful and handle the close racing challenge in a masterful way. There were a few wrecks but not many considering the many miles of racing we witnessed. My NASCAR racing experiences go back more years than I care to mention so racing is just a part of me. The spectator stands here are named after my old racing hero’s like Cale Yarbrough and Bobby Allison. We pulled into Lake Powhatan campground Monday afternoon and liked the campground very much. It’s near Ashville, NC home of the Biltmore Mansion so there are lots of activities in the area. The campground is heavily wooded and has a beautiful lake as well. We relaxed and enjoyed the mountain air and I took a walk down to the lake and beach area. It was so very steep that Trish did not want to try it. Today we took a drive on the historic Blue Ridge Parkway. The Blue Ridge Parkway is 469 miles long and actually begins just south of where we were in Shenandoah NP and follows the backbone of the Blue Ridge Mountains down past Ashville to the Smokey Mountains of Tennessee. We visited a Visitors Center and the Folk Art Center on the Blue Ridge Parkway. Both were great and well designed places of interest. In the afternoon we took a drive and ended up in Chimney Rock, NC. Chimney Rock is a massive rock structure and one of the scenic wonders of North Carolina. We invested a day in seeing the sights and back country of Virginia. Actually we traveled what is called by the state of Virginia “Scenic Byways”. Scenic Byways are back country roads that are considered very scenic. The ones we traveled were hilly and somewhat mountainous. We left Sunday morning and traveled from Mathews Arm in Shenandoah NP and stayed on Skyline Drive travelling 40 miles to the 60 mile marker. At that point we left the beautiful park and traveled the back roads to Charlottesville and on down to I-81 en-route to Blacksburg, VA.
We ran into several delays due to wrecks so we decided to get of I-81 at Salem and go over o New Castle, VA and then head south to Blacksburg. It was one beautiful drive through the Appalachian Mountains..
We spent the night at Walt and Lynn’s place in Blacksburg. Again, a beautiful place in the hills of Virginia. Walt is a retired professor from Virginia Tech and Walt holds a PhD from Florida State and taught Statistics for 28 years at VT. Lynn teaches first graders at a nearby school. We had a great time with Walt and Lynn, and even went out to eat dinner. Afterward we took a tour of the Virginia Tech campus and saw the building where Walt taught. 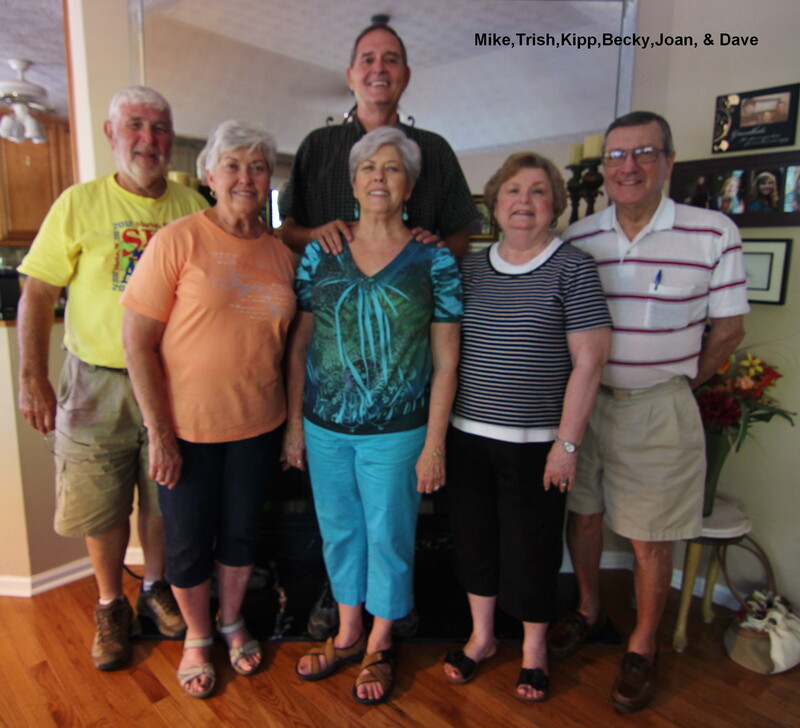 They are avid travelers and have been to Alabama camping at Gunter Hill near Montgomery and our fair city of Prattville. Maybe they will come back to Alabama in the near future. We sure hope so. 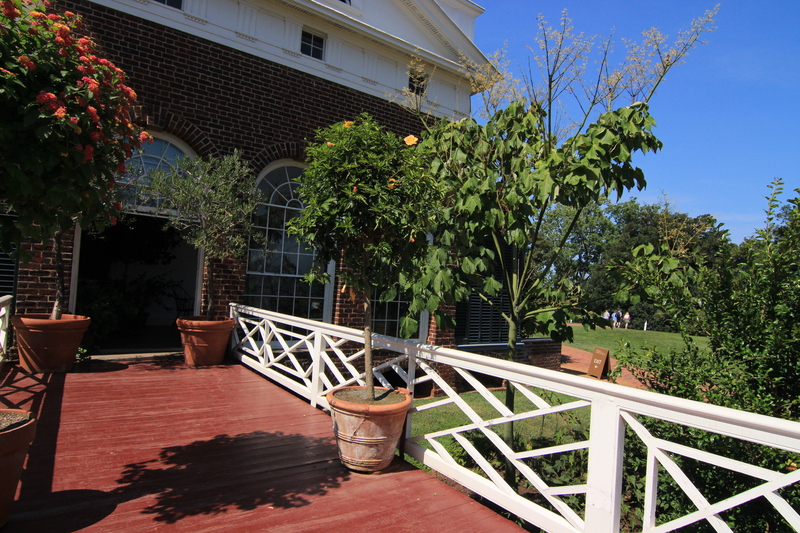 We visited Monticello the beautiful home of Thomas Jefferson yesterday. Thomas gave 40 years service to our great country. He served two terms as President and was our third President right after George Washington and John Adams. Prior his service as President, he wrote the Declaration of Independence at age of 33 years. Thomas Jefferson gave us the words “All Men Are Created Equal”. These five words have since been used by all countries around the world that establish or attempt to establish any form of a democracy. 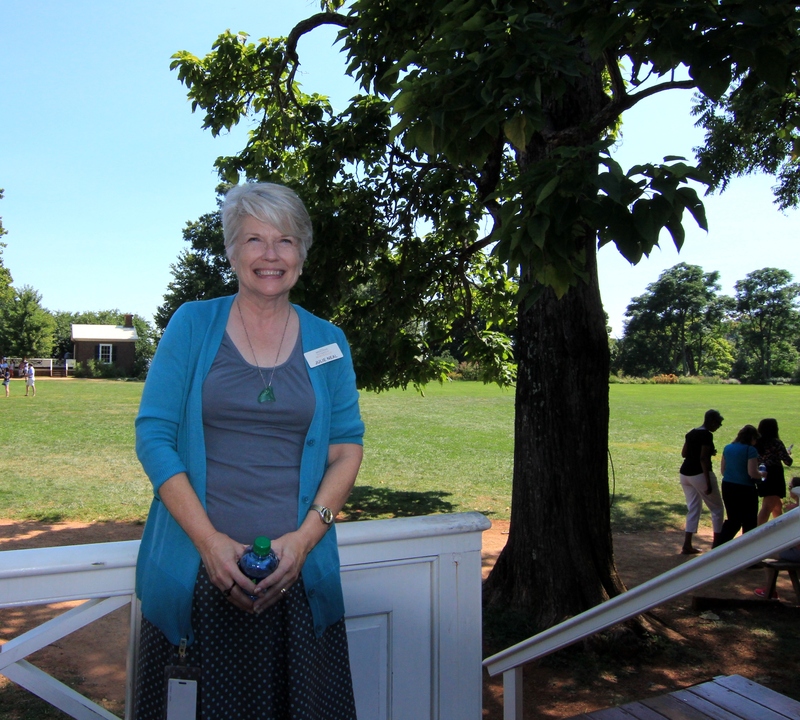 Our guide, Julie Neal, while at Monticello was very knowledgeable. 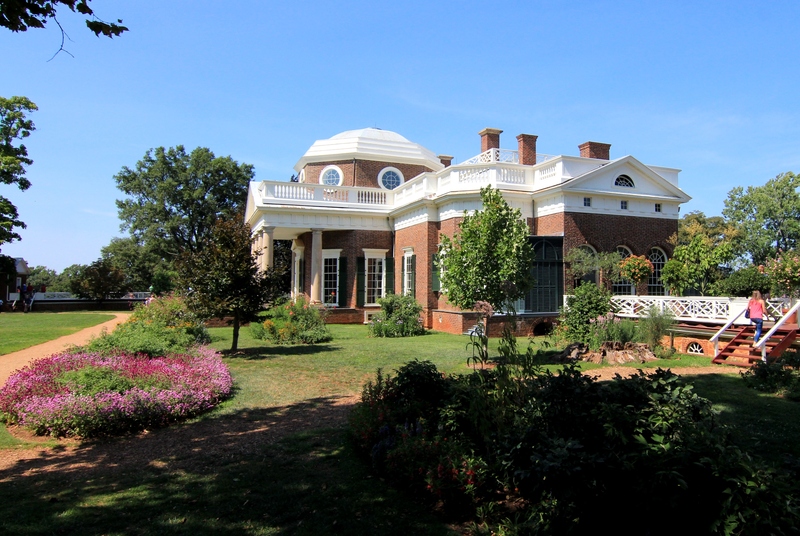 Little did I know that Monticello is a private non- profit foundation and that it has no associations with the federal government nor does it get any funds from the federal government. The mansion was in private hands (A Mr. Levy from New York owned it for 90 years). 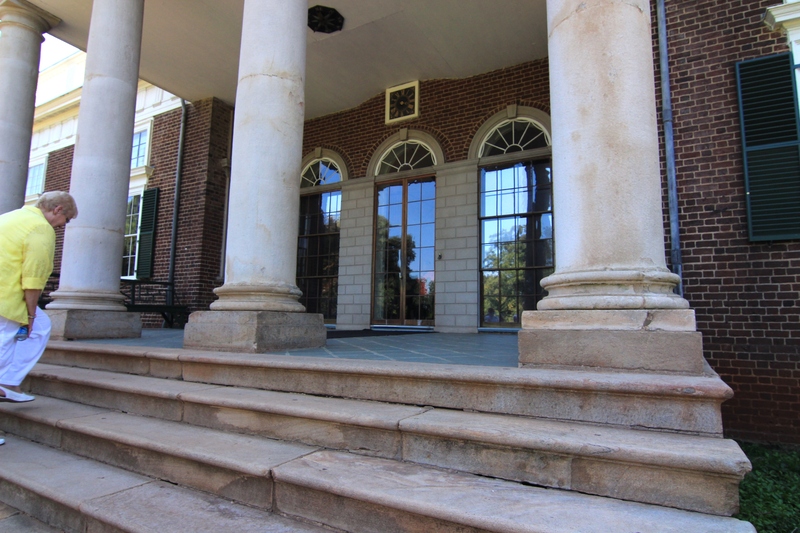 Mr. Levy (nor sure about Levy spelling) purchased the home two years after Jefferson had died in bankruptcy. Mr. Levy purchased the home and 200 acres for $2700! Even after accounting for inflation, that’s a good buy. Our second President John Adams, and Thomas Jefferson, our third President, were not always on the best of terms and in fact did not speak to each other many years. Much later in life they made amends and started to communicate again. Interestingly, both Adams and Jefferson died on the same day July 4, 1826. On his death bed Adams said “Jefferson Lives!”. Little did he know but Jefferson had died earlier the same day! After the tour was completed I asked our guide Julie if I could ask a few questions and she agreed. Jefferson angered Benjamin Franklin and John Adams as well while they were diplomats Jefferson stayed out very late and Franklin and Adams thought he was chasing the ladies. I asked Julie about this reputation of Jefferson. She grinned and simple said “He was a charming person” She went on to tell me he was very shy which surprised me for a man that accomplished all Jefferson had accomplished. Julie also thought President Adams was jealous of Jefferson. Both men served our country beyond all expectations. Maybe Adams was much more serious about his family life but both men served well. John Adams and his wife Abigail, produced a US President John Quincy Adams. John Quincy served almost 20 years and even served in the House after he was President! This is the only case that has ever happened.